When I say Kloten, the Zürich airport is probably the first thing that pops into your mind. But would you believe that there’s a great Badi there too, just a 6 minute drive from the airport? Better yet, for all those families who love do more than just swim, this is the Badi for you and actually worth a whole day out. Tanya, from Moms Tots Zurich and the You Tube channel Swiss Family Fun, is here to share with you the Freibad Kloten as her favourite new Badi and the first addition to the 2018 My Badi Series. So stock up on sunscreen, dust off those pool noodles, and let’s go swimming. Our new favorite is Schwimmbad Kloten Schluefweg north of Zurich. They are open from mid-May through mid-September, every day 9:00 - 20:00, until 21:00 during holidays. This pool is often included in the “Zurich Ferienpass,” which means free entry for kids during the five weeks of school holidays. We always drive, but you can easily take S7 train to the Kloten stop, which is only a 5 minute walk from the Badi. If you drive, the parking is a bit pricey and you need coins to feed the meter, so make sure to bring enough. The parking behind the pool next to the ropes course entrance is slightly cheaper if you don’t mind walking a minute back to the pool entrance. My kids love the big rocket ship in the middle of the pool. It has these short but very steep slides that make your stomach drop like on a roller coaster. I go on these slides with my kids and we laugh so much! 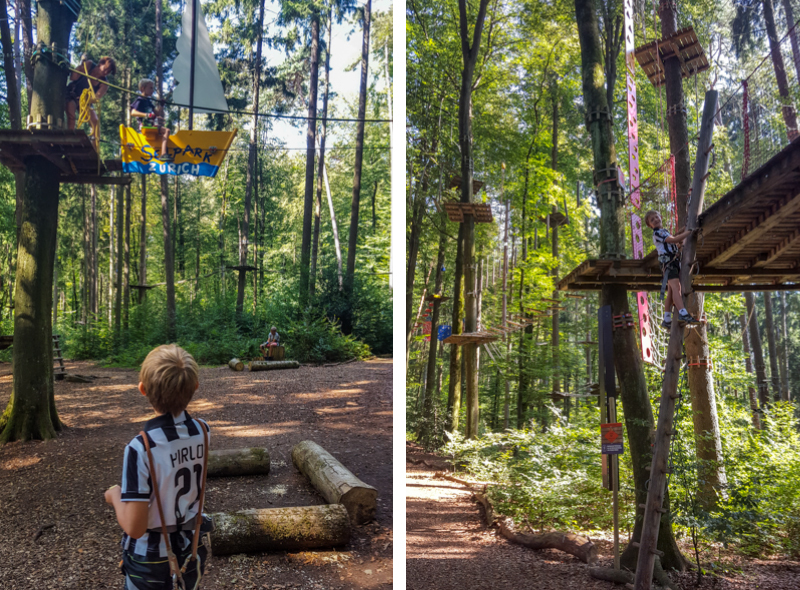 Next to the pool in the forest is a big ropes course. If you use the ropes course, it includes entrance to the pool making for a fun full-day activity. Another tip for the Badi - they have lounge chairs and umbrellas that you simply unlock with a CHF 2 coin, which means you can bring less stuff with you. I like that they have fresh salads, which is a nice break from fast food normally served. They also have a fire pit, so you can grill your own meal—something you’ll see at lakes but not often at the Badi. A big hat. Sometimes I’m just walking around watching my kids and the sun can be too much. My very wide brim hat is like a sun umbrella shading my face and shoulders and saving my skin. Our family has lived in Zurich since 2005, hiking, skiing and exploring Switzerland with our two boys. I’m the creator and editor of Moms Tots Zurich, where I enjoy helping families to experience the best of Switzerland. Follow us on Facebook, Instagram, YouTube and Pinterest for regular tips on weekend hikes and outings for families! Thanks Tanya for taking us to Kloten for a great place to swim! Make sure you head over to Moms Tots Zurich for ideas for your next Hiking trip! We love sharing different places to swim all over Switzerland and we like to call the series "My Badi", so if your’s isn’t on the list, we would love to hear from you!